Ernest Cline's 2011 novel Ready Player One is, depending on how you look at it, is either a throwback adventure that pays tribute to the popular culture of Generation X's 1980's childhood, or a crass, soulless stream of references that weaponizes geek nostalgia to make you feel something. Regardless of how one feels about the book, it seemed like a forgone conclusion that it would someday be adapted into a movie. Yet not even the author in his wildest dreams could have imagined that one of the most respected purveyors of modern day pop culture would be the one to adapt the book. Steven Spielberg raised eyebrows when he climbed on board, leading many to wonder what happens when one of the most respected filmmakers in the business tackles a book that not only references, but reveres, so much of his prior material. All is revealed with this weekend's release of Spielberg's fittingly huge adaptation of Ready Player One. For those unfamiliar with the source material, Ready Player One is set in 2045, where the downtrodden escape their lives by entering the online VR world of the OASIS. When the creator of the OASIS, an awkward recluse named James Halliday (an impishly awkward Mark Rylance) dies without a natural heir, he offers up control of the online world to whoever can solve three carefully hidden puzzles deep within it and claim the "Easter Egg" at the game-within-a-game's end. Wade Watts (Tye Sheridan, X-Men: Apocalypse), known within the OASIS as Parzival, is one of many self-proclaimed "Egg Hunters" or "Gunters" who become obsessed with Halliday and his beloved 80's pop culture in the hopes of finding clues to unlock the game's secrets. Naturally, there are big corporate bad guys with their own designs on monetizing the (mostly) free and open OASIS, and soon Parzival and his fellow Gunters find themselves in a race to keep the OASIS from falling into their evil hands. Spielberg is the absolute perfect choice for this film, for any number of reasons. What he's made is by its truest definition an adaptation of the source material. The challenges are obviously different, as what works on paper likely wouldn't translate well to the screen (who wants to watch a kid play Zork in IMAX 3D?) The film's challenges, which are naturally also its biggest action sequences, not only capture the spirit of the original novel, but take on a significance to the film's story, and specifically to Halliday's. Spielberg, along with screenwriters Cline and Zak Penn, also take advantage of the different medium to fix a lot of the novel's glaring problems. With Ready Player One, Spielberg is given a big, impressive sandbox to play in and immediately makes the most of it, with dazzling visual flair and plenty of heart. This is clearly the most fun he's had in years, perhaps even since... the 1980s. In making a film with so many throwbacks, the film is itself a throwback, but one that wisely uses nostalgia to enhance its core story rather than define it. Alas, not even Spielberg can make a perfect film. The film begins with a lot of exposition, which is a tad repetitive for fans of the book and long-winded for the casual moviegoer who just wants to, as the saying goes, get to the good part. Seemingly important events are glossed over, others aren't defined enough, and quite a few opportunities are missed. And then there's the matter of I-Rok (T.J. Miller of Deadpool and Silicon Valley), a character expanded from minor annoyance in the novel to right hand man to the big bad in the film. What might have otherwise been a hammy comic relief bad guy when filtered through Miller's recent offscreen transgressions comes off as awkward and uncomfortable. Despite this one odd casting misstep the rest of the cast seems to be having a lot of fun. While the book primarily focuses on Wade's point of view, the movie gives the rest of the "High Five", the leaderboard-leading good guy Gunters, more of a stake in the story. Parzival's biggest rival/potential love interest Art3mis (Olivia Cooke, Thoroughbreds) is basically a co-lead here, at one point even being given at storyline that was Parzival's in the book. The remainder of the "High Five", Gunters known as Aech, Daito and Sho, are all well-cast and dive right into their roles, though to reveal their identities (or the actors playing them) would be to spoil some fun surprises. Ben Mendelsohn (Rogue One) once again plays a villain, namely corporate stuffed suit Nolan Sorrento, but takes advantage of every opportunity he gets to chew scenery, especially in the OASIS. There's a scene, specifically one of the challenges, that our heroes face in Ready Player One that perfectly encapsulates the film both on its own effort and as an adaptation of a book. Revealing exactly what it is would spoil one of the film's most inspired moments, but what's important about the scene is what it does. One point of view is that it's Spielberg's message to fans of the book, recognizing that changes sometimes need to be made but what's important is that the spirit and warmth of the story are still shining through. A more cynical eye, and there will likely be plenty as there were with the novel, may see it as mining beloved popular culture for cheap recognition. But the film is surprisingly respectful of what it references, more cognizant of what these symbols mean to us than just what they are. (Though one would be remiss not to notice that the corporate synergy is strong with this Warner Bros. movie.) 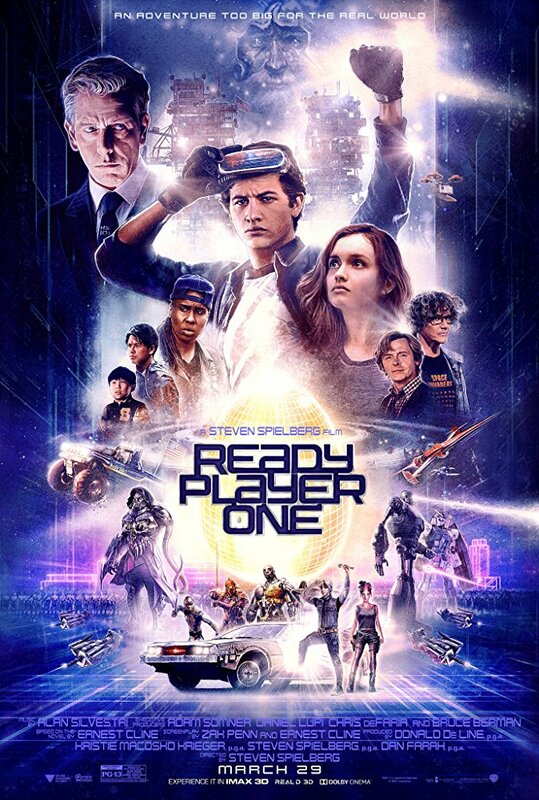 Ready Player One is a film that rewards the viewer for taking the sometimes bold step of allowing oneself to recognize an adaptation as its own unique entity, and just giving in and enjoying it without picking at it for all the changes you don't like. It's by no means a groundbreaking film, but thanks to a clearly refreshed and less self-serious Spielberg, and a very game cast, Ready Player One is a thrill ride with a futuristic look and a nostalgic feel, scratching an itch we may not have known we had for a good old-fashioned treasure hunt adventure.